More than 60 years of ingenious headphone engineering has been applied into the new HD 800-S. Incorporating Sennheiser’s most advanced driver technology, these open, circum-aural dynamic stereo headphones redefine what reference-level audio is all about. You will form an altogether new height of sonic perspective as you experience a high-fidelity natural hearing experience. 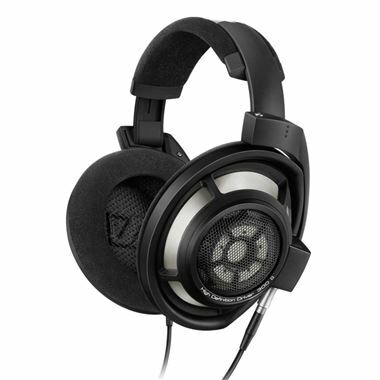 The new HD800S offers even better high precision connectivity options and is now supplied with two connection leads, a 6.3mm connector and a XLR-4 balanced cable to offer even better quality sound from sources with balanced outputs such as the Sennheiser HDVD 800 headphone amplifier.The enhanced sound reproduction of the HD 800 S is achieved through the addition of the innovative absorber technology that was pioneered in the Sennheiser IE 800 – a breakthrough that preserved the audibility of very high frequency sounds by eliminating a phenomenon known as the “masking effect”, where the human hear struggles to hear frequencies of sound when lower frequencies of a higher volume occur at the same time. By absorbing the energy of the resonance, Sennheiser’s patented absorber technology prevents any unwanted peaks and allows all frequency components – even the finest nuances – in the music material to become audible. This innovation was a key element in making the IE 800 the world’s best sounding in ear headphone, and in the HD 800 S it helps to bring even greater purity and precision.